Friday afternoon after my work week, I again drove east to the Sierra and overnighted on a dirt road off of Evergreen Road. Saturday morning June 25 was up about sunrise then drove out to SR120 and into Yosemite National Park. East of Gin Flat conditions appeared dry and wildflowers limited so continued east. 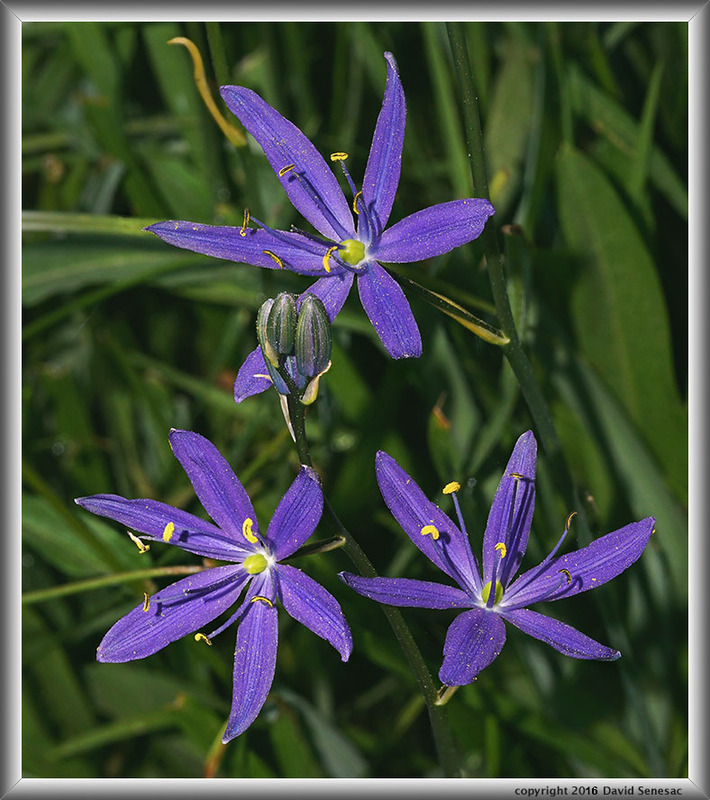 I drove down the Yosemite Creek campground road to a wet meadow where I shot a close-up of 3 camas lilies below. Back on SR120 then further east stopped at 7800 feet on the north side of Yosemite Creek canyon where the highway goes through exfoliating granite slabs. 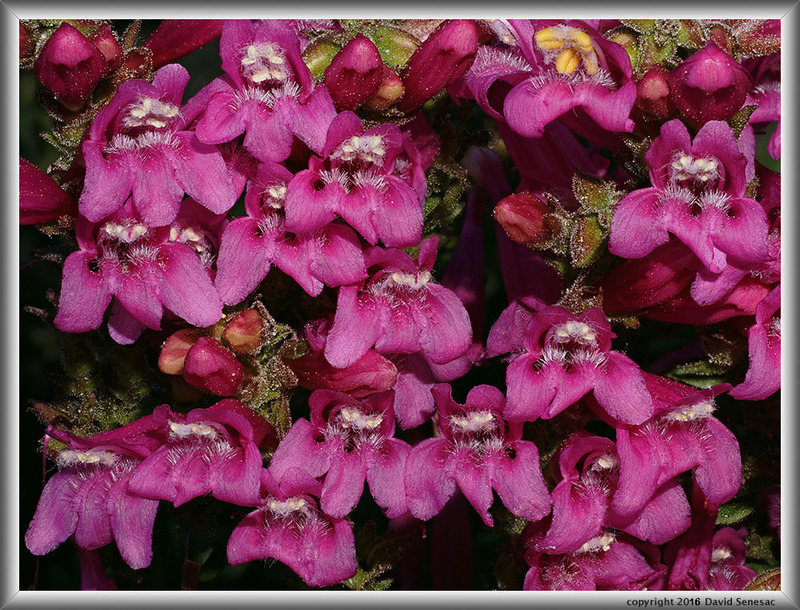 The highway was lined with magenta hued penstemon so walked up and down the road looking for workable situations. Found a dense group of mountain pride penstemon, penstemon newberryi, above with flowers mostly oriented in front looking down their tube throats. The reason for the other name of these flowers, beard tongue, is apparent from this perspective. 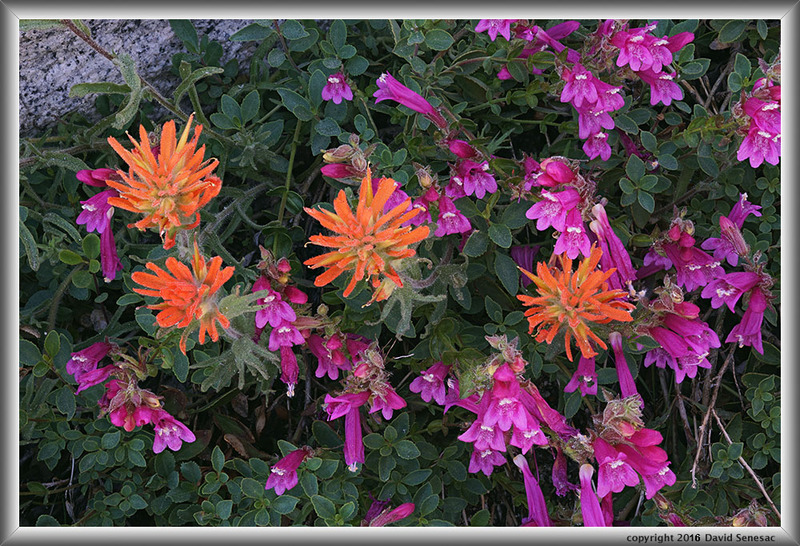 Further east on the north side of Yosemite Creek canyon stopped at another area of granite slabs where as late morning vehicle traffic buzzed by, took the above image of wavy leaved paintbrush, castilleja applegate, mixed in with mountain pride penstemon. Used both my colapsible disks to shield concussions from passing cars. Quiet periods between car trains were long enough to take a set of still shots however each rustling of flowers and leaves impacted misregistration since they would not at the detail level of my sensor come back to exactly the same locations. Hence a reason I try to avoid subjects along roads with heavy traffic. 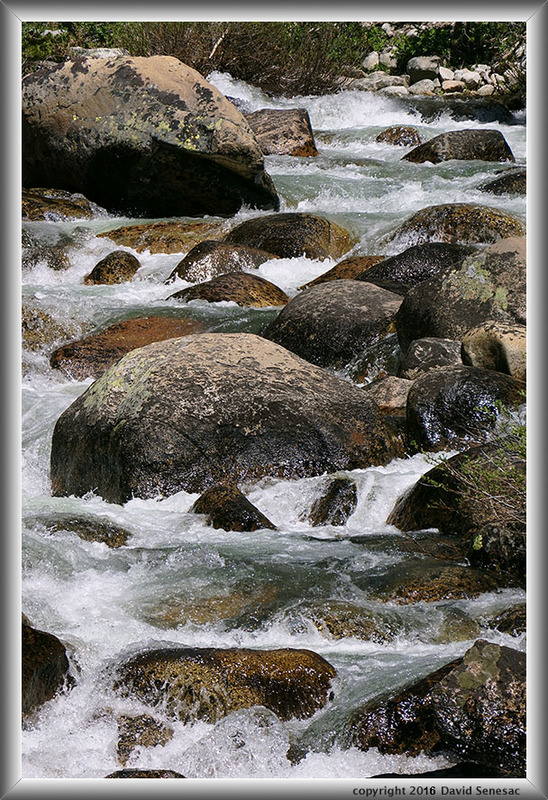 Later mid afternoon photographed above a section of rapids on the Lyle Fork of the Tuolumne River. I used my Sony SEL55210 telephoto lens at ISO 400 with apertures set to F8 and resulting shutter speed about 1/1600 second to freeze whitewater. Instead of focus stack blending in post processing, I only aligned frames then used a Reveal All Layer mask to add each receding focus frame with the brush tool, blending in sections using the boulders as a base structure. If whitewater sections had been broader across areas between boulders that would not have easily worked. Alternatively to using a larger aperture, one might use a traditional technique of simply raising ISO and stopping down more but that would have resulted in less resolution. I drove west on SR120 beyond Pothole Dome and parked at a familiar location, then hiked out to one of the many domes to the north. This was the primary interest of my weekend work. 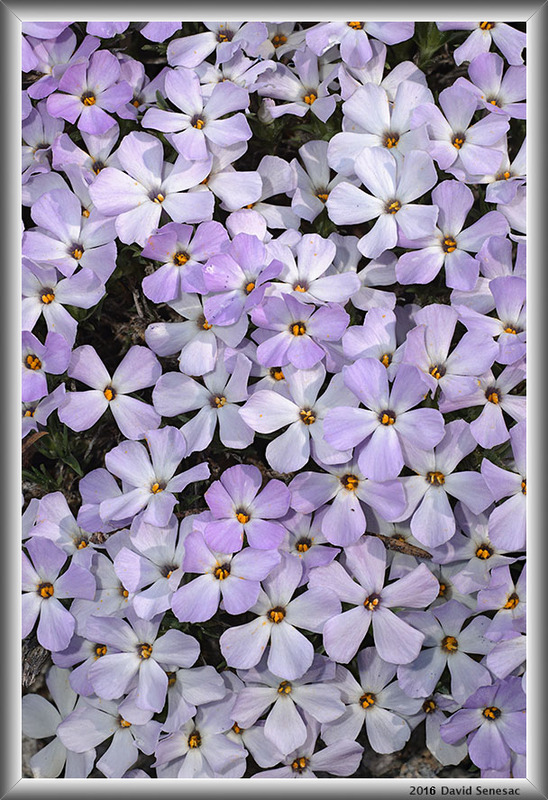 Along the way on my hike, I stopped to take the above closeup of a dense patch of spreading phlox, phlox diffusa, that frequently offers exceptional near close-ups because of the plant's tendency to grow flat right above ground level. With the sun coming through tree canopies at an oblique angle providing soft shadowing with a bit more brightness towards frame top where one wants it, I chose not bother with using my diffusion disk. With tradition fixed lens photography, one would center position a lens perpendicular to this section of flowers and then stop down to a small aperture since flowers at the center directly below a lens would be closer than those at top and bottom. With focus stacking one has more positional options similar to using a tilt lens of a view camera. In this case I positioned my lens a few inches below the bottom of the frame with an oblique view so the lens to subject distance increased betweem frame bottom up towards frame top. Then made 9 shots with each focus point different along the bottom to top frame axis and all at a sharp F10. Accordingly from bottom to top one will notice a slight decrease in size of flowers. Continuing on, I climbed my target dome and then went about exploring where I might shoot from. 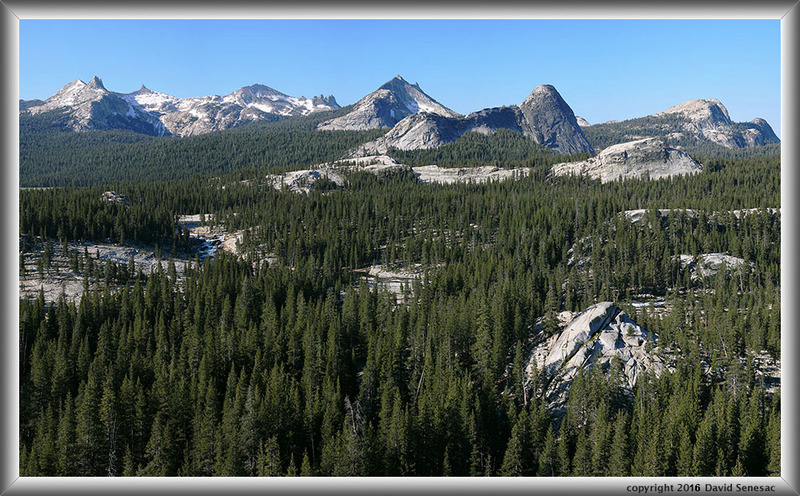 This Tuolumne zone was once under the enormous weight of a slowly moving grinding ice cap rising above all but highest Sierra Crest peaks. It may arguable have the greatest density of aesthetic glacially created granite domes on our planet. Before the trip studying the topo I thought this dome would offer the best perspective on the area of domes. I made two sets of images with another not shown from a higher position on the dome, more a telephoto only including the central group of domes at frame left and none of the foreground. The above is a large stitch blended image using my sharp Sigma 60mm F2.8N lens of 6 columns by 2 rows with a size of 19000 by 9000 pixels or large enough to make a sharp 63 inch by 30 inch print at 300 dpi. I usually do not like large shadows in my images so included the lower frame only with some resistance because the lower left corner is not a solid shadow but rather soft intermittent light was coming through openings in a pine canopy. The images were made a bit before 7pm PDT when shadows were growing and might have been better an hour earlier. Note some of the following are not on the USGS topographic map but rather are well known climbing community names. From skyline frame left is peak 11120+ feet that is south of Elizabeth Lake, Unicorn Peak 10823, The Cockscomb 11065, Fairview Dome 9723, peak 11268, Cathedral Peak 10971, Tresidder Peak 10600+, forested Cathedral Pass 9680+, Medlicott Dome 9970, Tenaya Peak 10280+, and at frame right Clouds Rest 9926 feet. Below the skyline at frame left is West Cottage Dome 9120+. A bit below and left of Cathedral Peak is Daff Dome at 9153. Below Medlicott with a sheer yellow face is Drug Dome 9320+ and in front of that a diagonal ramp rising to the right to top of The Lamb at 9920 feet. Below Clouds Rest in shadow is Pywiak Dome at 8851, a bit lower is a small section of SR120, and to the right the bald summit of Virgin Dome 8680+. In foreground sunlight on the near bench are clumps of stonecrop and sulphur buckwheat amid many unusually large phenocrysts of feldspar that create a knobby surface that makes Cathedral Peak granite famous with climbers. Beyond the bench are a few Sierra juniper with the forest beyond primarily lodgepole pines. I was out at Tuolumne Meadows turf pools at sunset and dusk but the breeze resulted in mediocre images. Spent overnight down along US395 off a dirt road. As dawn rose Sunday morning June 26 rejected any notion of working Mono Lake due to smoke in the basin from the Marina Fire just north of Lee Vining and instead drove back over Tioga Pass to the Soda Springs Stables parking lot in Tuolumne Meadows to proceed on my primary plan hiking north on the Pacific Crest Trail down the Tuolumne River. In the 1980s with my Olympus OM-4T had photographically explored these areas extensively so knew where I would go. At Delaney Creek vectored off the wide beat up thru hiking trail and rambled off across the grassy west end of Tuolumne Meadows. The above image shows a section of Delaney Creek in the foreground with in the background at skyline left to right, The Unicorn, The Cockscomb, Echo Peaks, Cathedral Peak, and Fairview Dome. Lower frame left are some early blooming cinquefoil and alpine laurel. 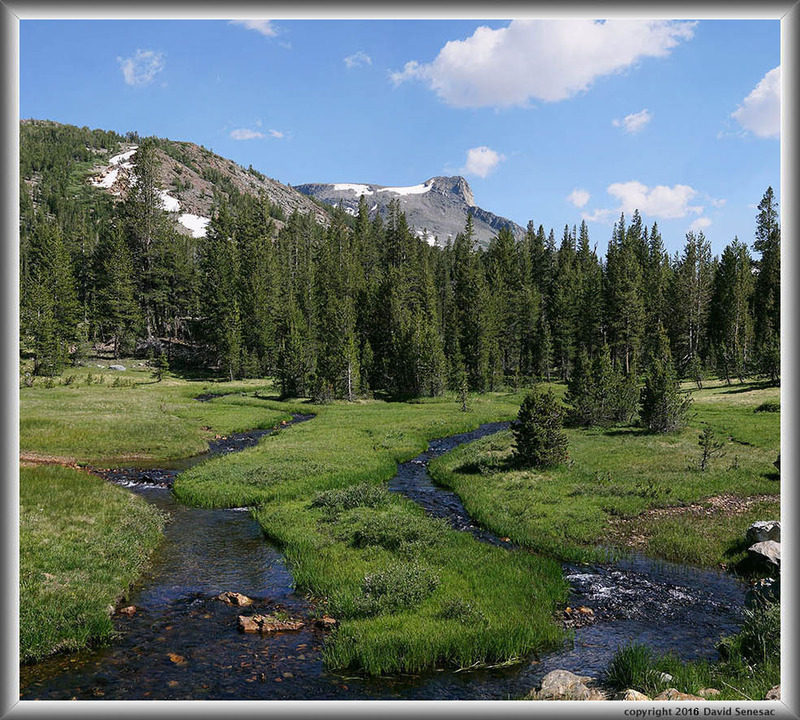 At this time of summer when the creek is high, good numbers of pan-sized brook and brown trout move up the stream from the larger Tuolumne River. At page top is a reflection in a flooding backwater pool of the Tuolumne River in Tuolumne Meadows with the Cathedral peaks noted above. At frame mid right one can see a row of sections of grass that delineate the edge of a former river channel which acted as a buffer quieting the water surface in this backwater. At frame right below Fairview dome is the smaller Marmot Dome, and below that a large deer herd in the meadow. Select the enlarged vertical slice view to see the deer in the right slice of this large 19300 pixel wide stitched image. 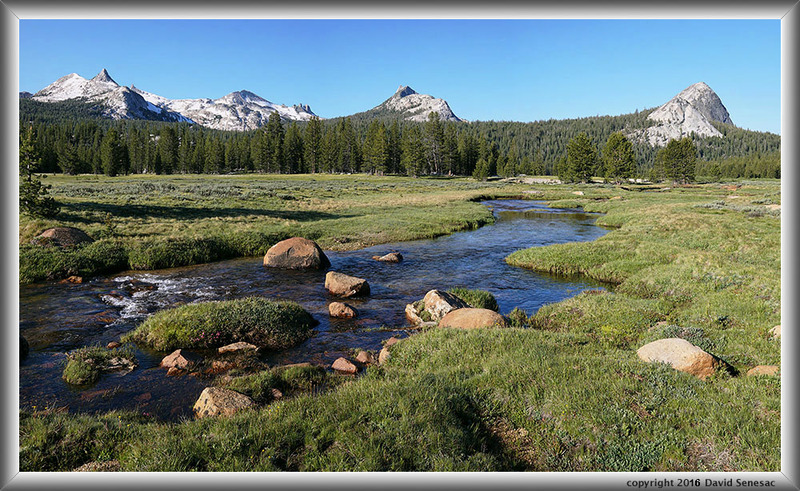 The final image shot that morning above shows a section of the Tuolumne River below Tuolumne Meadows where it flows down across glaciated bedrock with the Cathedral Range peaks noted above in the background. At this time of year the river while below the peak level of late May is still rather high with cold snowmelt. By August however most water are residual flows draining through the extensive forest and meadow landscapes in upper basin zones thus is not as cold. Accordingly these wide sections of river through bedrock below the meadow offer fine areas for a day playing about in the river out of the main flows in shallow little whitewater sections. Though water temperatures are still too chilly to stay in very long, the sun warmed, river smoothed, granite shores are a joy to lay out on after coming out. 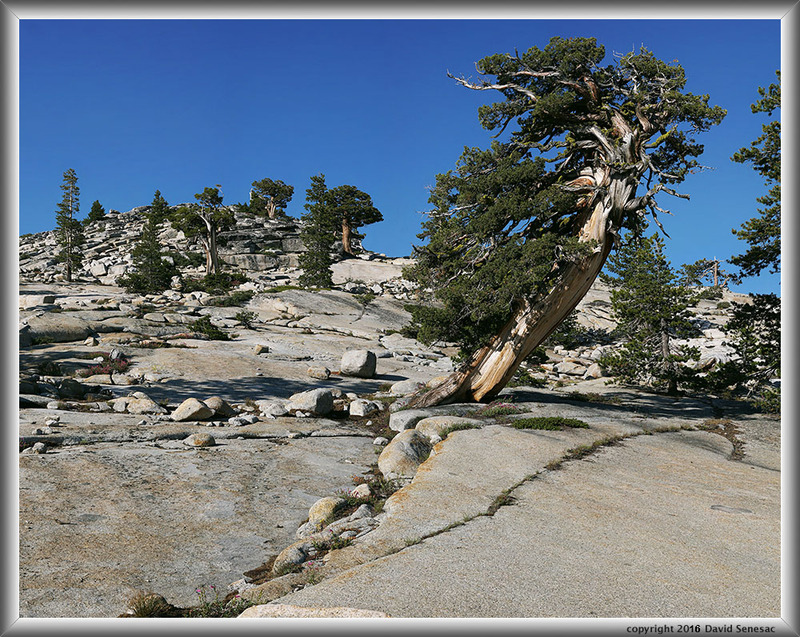 I hiked to a dome east of Lower Tuolumne Meadows with an exceptional view however smoke from the Marina Fire near Lee Vining had moved across the crest westward giving otherwise wonderfully blue skies a slightly dirty cast. I took some mediocre photos then headed back to the trailhead glad I'd managed some nice images earlier in the morning while skies were still nicely blue. With smoke in the air I had no interest in staying in the mountains the rest of the 3 day weekend so made the long drive home. During the following week, smoky forest fires became an issue affecting where I might go over the coming Independence Day holiday weekend. First was the noted Marina Fire on the north side of Lee Vining. A much larger fire had been burning far to the south about Kernville burning a large number of homes, devastating mountain folk in that area. Its smoke had been generally flowing off to the northeast. The Trailhead Fire had just broken out near Auburn causing smoky skies across the Tahoe region and was likely to continue to burn for some time with smoke moving eastward. Thursday night before the weekend, it appeared the Marina Fire smoke was over while winds from the other two fires would not affect the Central Sierra so decided to return to Tuolumne Saturday and then take a look at the areas of the Mammoth region. Friday after my work week drove to the Sierra and east on SR120 over Tioga Pass down to the 9k bend to overnight. Dawn Saturday morning July 2 was on my way back over the pass then down to the Soda Springs Stable parking lot. Picking up where I had been the previous Sunday I would be hiking directly to the same dome though earlier in the morning while light was much better. As I set out down the Pacific Crest Trail, the sun was already shining on the Catherdral range, skies were sunny blue at a mid 40F temperature. There were already a few thru hikers on the trail that quickly passed me by. Before reaching Delaney Creek I vectored off the trail and stayed near the top of the slight ridge east till reaching the dome. Climbing to the top requires some class 2 use of hands up a moderately steep slope. At the top promptly took a set of shots above to make a large landscape. I better liked the viewpoint from the dome on the west side of the river I'd shot late afternoon the week before. The large area of forest in the lower left frame quadrant detracts from the images aesthetic versus cropping just below the river. The image just above at the top of this section shows that crop. I spent a couple hours further down the river but none of those images were notable and by noon was back at my car. 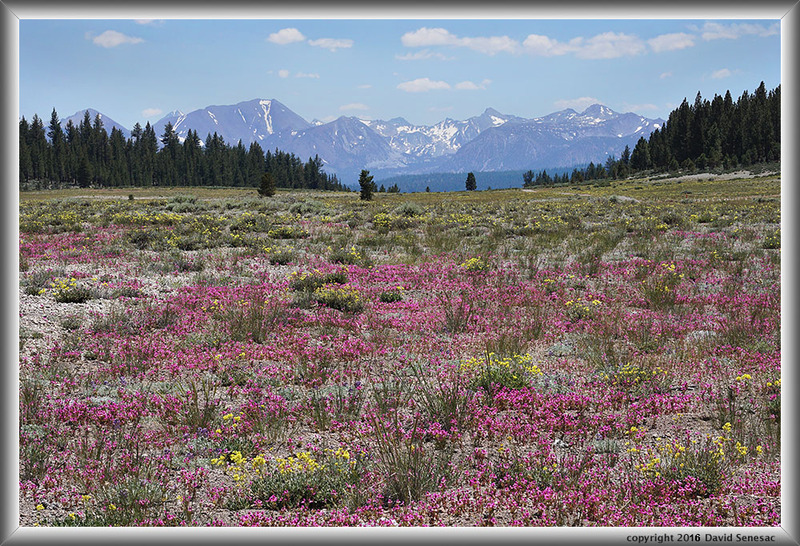 I drove east down to US395 then south to Mammoth Lakes then back west on SR203 to Minaret Summit where I drove north out on a tricky jeep road towards Deadman Pass to evaluate wildflowers on some landscapes I've been interested in for years. The 4WD road contains 2 nasty spots my Forester was barely able to cope with in clearance. Not a route I would recommend unless one has 4WD with high clearance. Well wildflowers were ok though noticeably below better years so decided to look for something else to work Sunday morning. And it was very windy. Enough so I had doubts about what conditions might be even early the next morning. The town of Mammoth Lakes was a zoo, especially near the art and wine fair and Vonn's supermarket. The rest of the day I burned up quite a lot of gasoline exploring various roads. The only place that excited me was out in the Mono Craters dirt road maze where monkeyflower were putting on a belly carpet show. And at the end of the day disperse camp parked way out on a favorite lonely dirt road and decided I would spend the morning up in McGee Canyon. Dawn Sunday morning July 3 I was up and back out on US395 when light began shining on Mount Morgan above Hilton Creek. The warm light was mediocre as air in the Owens Valley and further east were apparently being affected by all the fires. 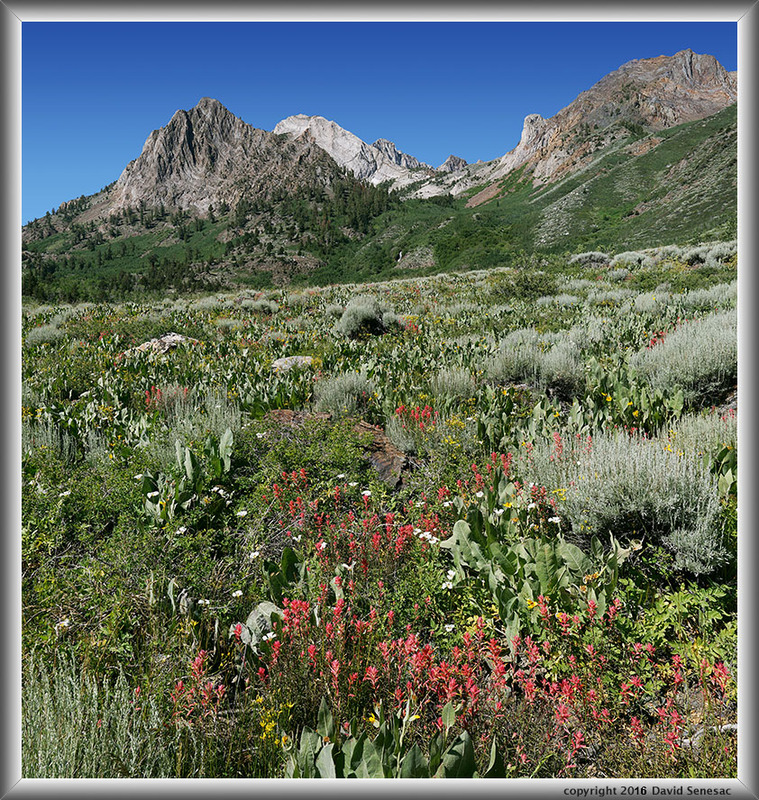 I drove up to the McGee Creek trailhead at 7800 feet and slowly got on the trail as there was little reason to reach the famous area of wildflowers at the canyon bend early as it is shadowed by the high ridge just east. There was a pretty strong cold night sumping breeze coming down the creek. Although I saw lots of close-up material, with the vegetation rocking around in the breeze, I could only make note and hope for calm mid morning. I tried 3 wildflower subjects with Mount Baldwin in the background and have only bothered to post process the image above that has a large patch of giant red paintbrush, castilleja miniata , in the foreground. The canyon bend has a jungle of wildflower species mixed in with much common sagebrush, artemisia tridentata. There are also numbers of white hued pinyon mariposa, calochortus bruneaunis, lots of woolly mule's ears, wyethia mollis , and mountain butterweed, senecio integerrimus. Down below the big plants are a long list of other species. In the middle ground is Horsetail Falls with an expanse of avalanche stunted quaking aspen. Many of the trees above are either jeffrey pines or Sierra juniper. Colorful geology is paleozoic rock. I decided to try and work some flower close-ups so hiked up canyon where I might find more wind protected locations without much breeze. On the way noticed the case loop for my Impact 32 inch diffusion disk had torn off my pack so was somewhere along the route I'd taken. Thus spent about an hour backtracking but had no luck? Back down at the main canyon bend, a 40 something couple I'd noticed earlier stopped to ask me if the person they had given my diffusion disk to had found me! Unlike 95% of others hiking the canyon, I was often NOT on the trail and instead rambling about away offtrail so that person had no doubt passed me by and likely was now down at the trailhead 2 miles away. I explained to the couple that there are times when the better action is to leave something left on the trail where it lies if there is a chance the owner might be backtracking to find it. Especially a day hiking photographer. With the breeze making close-up work a nuisance, I decided to quickly ramble back down to the trailhead and hope the person with my disk left it at the trailhead kiosk. Well back down at the bottom nay it was nowhere. Either the person decided to keep it themselves or more likely did leave it say at the kiosk but some other person at the lot grabbed it. Many of those parking at the lot don't hike at all but rather have simply explored driving up the road to the end and maybe used the restroom, and have an urban ethical orientation. The disk new cost was just $20 and mine was one step away from being replaced because they readily become soiled and beat up. More importantly for me it made the notion of close-up flower work on the remainder of the trip limited to the extent I decided to cut my trip short a day and immediately start on the road home. Driving north on US395, I vectored off out onto one of the Mono Craters maze of dirt roads. Quickly found much better areas of monkeyflower than I'd seen Saturday. And found an open expanse with an outstanding background of Sierra peaks. Unfortunately at just 1 hour past mid day, rather harsh light and like much of the weekend, it was breezy. But I was patient long enough to capture a single frame set of shots for the above image with dwarf monkeyflower, mimulus nanus, sulphur buckwheat, eriogonum umbellatum, and jeffrey pine in silhouette. Will be much better when I return on a future year and camp at this very lonely zone then work the scene early morning in good front lighting. The flowers out in these pumice expanses were now peaking and would not last but a few more days before ending their show. Back on SR120, I stopped about 4pm below Tioga Lake where the meadow was wonderfully green in the afternoon light. Two cobble bottom stream channels flowed right at my tripod position with the prominent knob on Mt. Dana's shoulder at center in the background. A simple yet beautiful scene one would enjoy gazing out at for lunch by the road side. Later in the afternoon at 6:15pm was on the hill above Olmsted Point where I was intent on capturing a shot I'd worked several times in the past with my 4x5 view camera. The above image came out nicely at a large 12600 by 9900 pixel size. The juniper at frame right is a spectacular specimen while 3 others higher up on the hill have fine forms. Very much a test for the photographer skill of tripod placement. At this time of summer the joint cracks also show the magenta hued mountain pride penstemons adding some color to the scene. 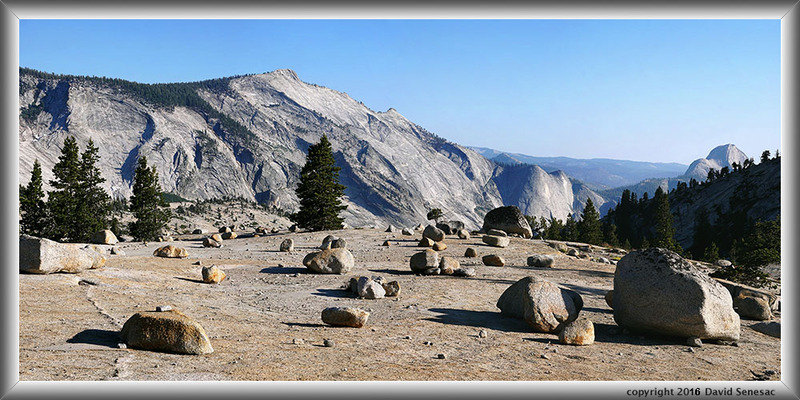 Nearby is a superb landscape towards famous Clouds Rest and Half Dome though very few people that stop at Olmsted Point ever see this because it is not in view at the big parking lot below and only really looks good for a short period in late afternoon. I caught this when the ridge in front of Half Dome was a nicely shadowed silhouette. Much later and the shadows off the foreground boulders loose impact. Even some snow patches were still left on Clouds Rest. Continuing west on SR120 through Yosemite, I had just one more place to stop. By time I reached the location, it was 8pm near sunset. The location was down in deep forest roadside so was already well shady and getting darker minute by minute. 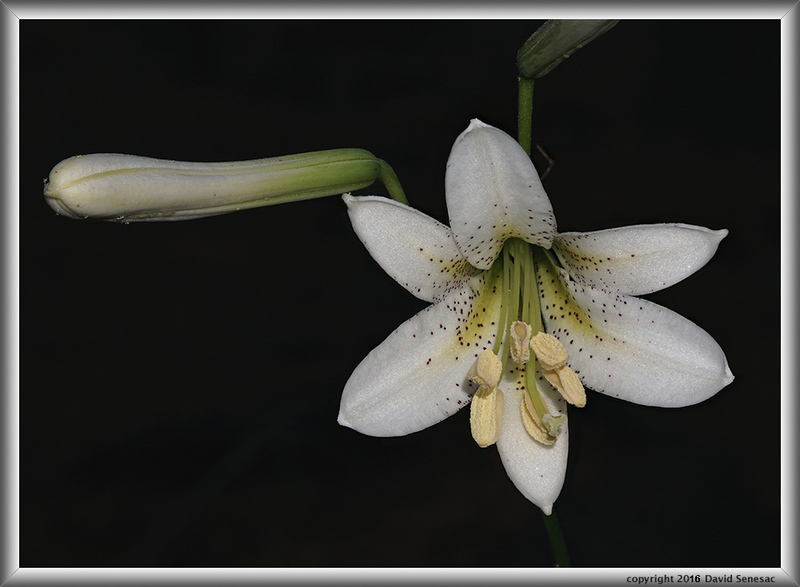 Arguably the most impressive native California member of the lily family in our state is the uncommon Washington lily, lilium washingtonianum. Although most people have never seen these large white flowers in the field, for over a century it has been a favorite of horticulture enthusiasts and extensively cultured. The flowers when freshly opened have a deliciously wonderful fragrance. Over the years none of my images until the above have impressed me as it is a quite difficult subject. The 2 to 5 inch long flowers are somewhat difficult to capture in high detail because of lens depth of field limitations for such a 3-dimension subject, much like big iris's. Thus in the past have had to be content backing up away enough and stopping down with a small aperture as much as possible. However with the above image brought the new focus stack blending technique to bear to capture a highly detailed image. The full image size is 4300 by 3100 pixels. Another issue with these flowers due to their strong fragrance is most blossoms tend to be swarming with small feeding insects especially little black beetles. And it does not take but a day or so after opening for the beetles to wreak aesthetic havoc on these natural beauties. Simply trying to scare the dozens of beetles off does not work as they simply scurry down into the deep flower tube. The one chance a photographer has is to find a flower that has just opened within a few hours upon which the beetles have not yet discovered. In this case I surveyed about a dozen plants, each with up to 3 blossoms, and only this last one had a newly opened bloom without beetles. And yet another issue with photographing the plant is it is tall on a single stem at 2 to 8 feet thus tends to bob about even in the lightest breezes. The form of the stem and leaves is similar to tiger lilies with leaf whorls around a single stem so once a person has seen this distinctive form it can be spotted road sides even if not in bloom. Breezy Sunday afternoon winds had died down by sunset that is common at mid forest elevations in the Sierra so when I stopped at my location, I knew I had a good chance if I could find a good bloom. In order to image the below, I picked up two long dried stalks laying on the forest floor from last year and used them like a tripod to brace the stem to the ground just below my camera frame. I used the in camera A6000 flash and that is why the background is dark.